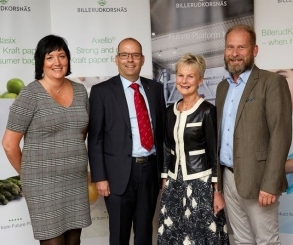 (L-R) Petra Einarsson, President and CEO BillerudKorsnäs; Carl Fredrik Graf acceding Governor of Östergötland County; Elisabeth Nilsson, retiring Governor of Östergötland County; and Håkan Krantz, Manager of Skärblacka paper mill in Sweden. Sept. 6, 2018 (Press Release) - BillerudKorsnäs [on Sept. 5] opened one of Europe's largest and most efficient MG paper machines at Skärblacka production unit outside Norrköping in Sweden. The opening ceremony was held by BillerudKorsnäs President and CEO Petra Einarsson, retiring Governor of Östergötland County Elisabeth Nilsson, acceding Governor of Östergötland County Carl Fredrik Graf and Factory Manager of Skärblacka Production Plant Håkan Krantz. More than 500 people attended the ceremony at the Trozelli Gallery in Norrköping. BillerudKorsnäs is a leading manufacturer of packaging papers, including: kraft and sack paper, liquid packaging board and cartonboard, containerboard (fluting and liner), and market pulp. The company has 8 production sites in Sweden, Finland and the UK. To learn more, please visit: www.billerudkorsnas.com.